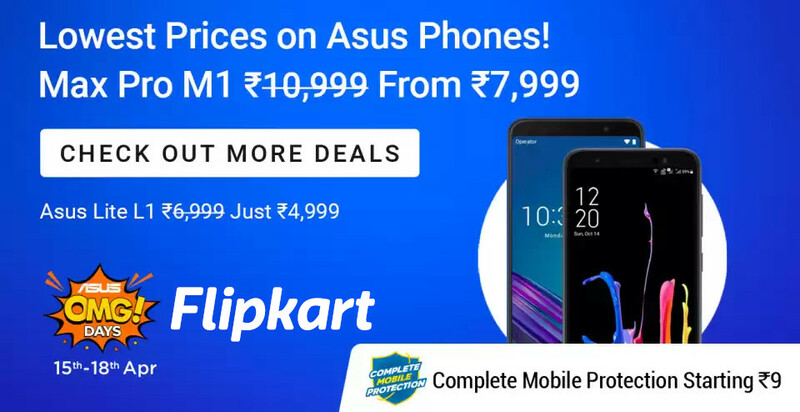 ASUS and Flipkart are back with OMG Days sale that starts from today, 15th April till Thursday, 18th April 2019 (till mid-night). This includes offers on the entire range of ZenFone models. It offers flat Rs. 3000 off on all variants of ZenFone 5Z, flat Rs. 1000 off on ZenFone Lite L1, flat Rs. 500 off on ZenFone Max M1, Max M2 and all variants of ZenFone Max Pro M1. It also offers No cost EMI on Bajaj Finserv, Credit and Debit card from all banks and Flipkart’s Complete Mobile Protection Plan also covering theft at a very attractive price. You can check out more details on ASUS OMG Days Sale page on Flipkart.